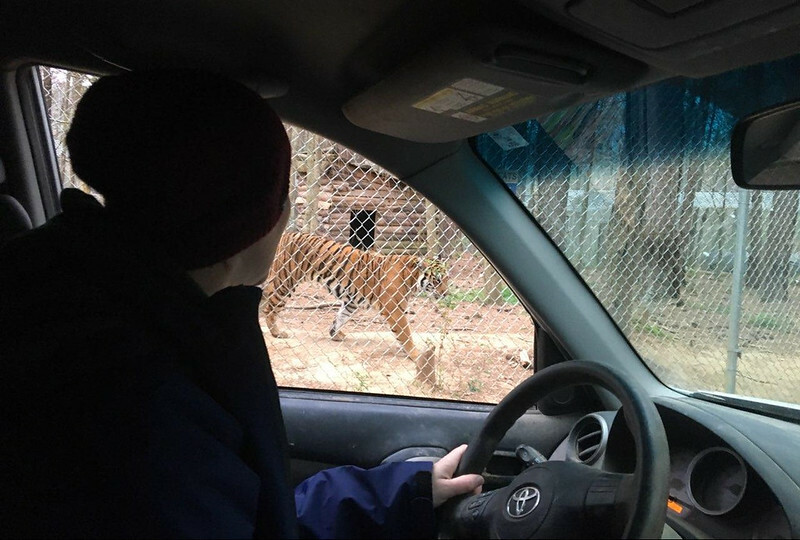 Each morning a keeper must go out in a closed vehicle and ensure that every animal is where they need to be and all fences are intact and standing. Once they have deemed the sanctuary safe, they open it up to volunteers and guests for the day. 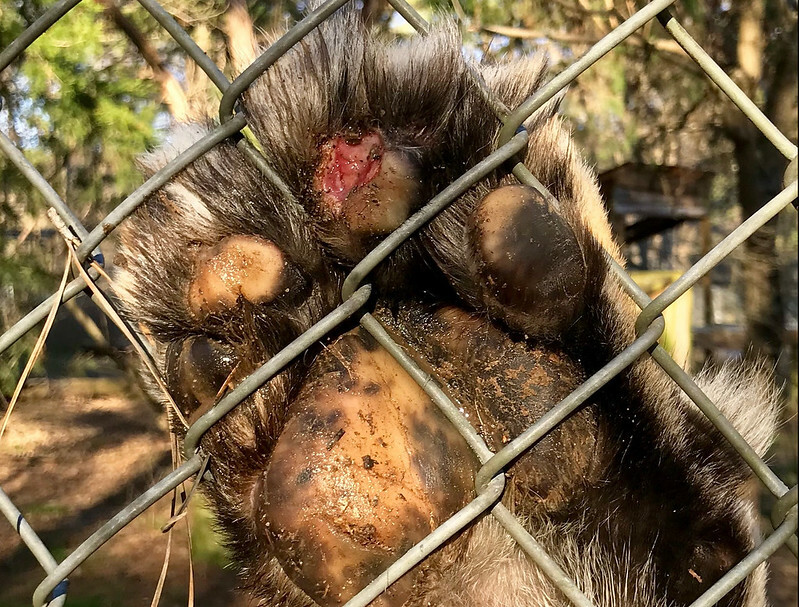 Carolina Tiger Rescue is home to a large number of aging animals who all have different needs, quite a few of them require medications. 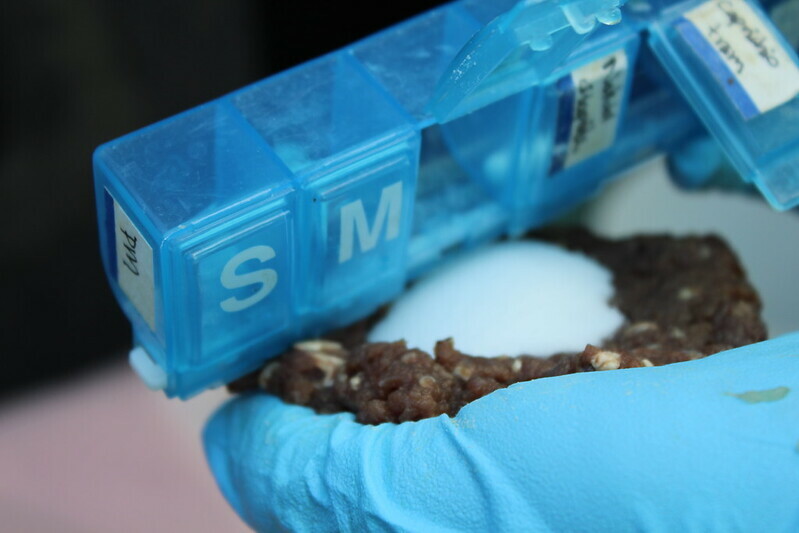 Keepers go out each morning and give medications to all the animals that need them. This also allows them to get a good look at each animal, to see how they are doing that morning. Giving meds to a cat is not always easy. These large predators certainly have a mind of their own. The meds are hidden in treats and given to them on a wooden treat stick. The cats though like to make the keepers work for it sometimes and will attempt to take their stick from them, as Kaela Tiger was trying to do here. 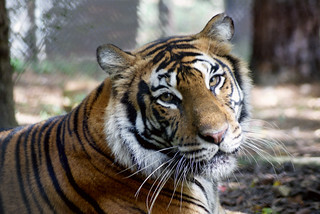 Carolina Tiger Rescue is home to 2 species of animals that are not cats. We have kinkajous and coatimundis who are both primarily fruit eaters. Because of their different needs, different diets must be made each day for them. These diets provide a wide variety of choices for them to eat that includes fruits and of course protein. 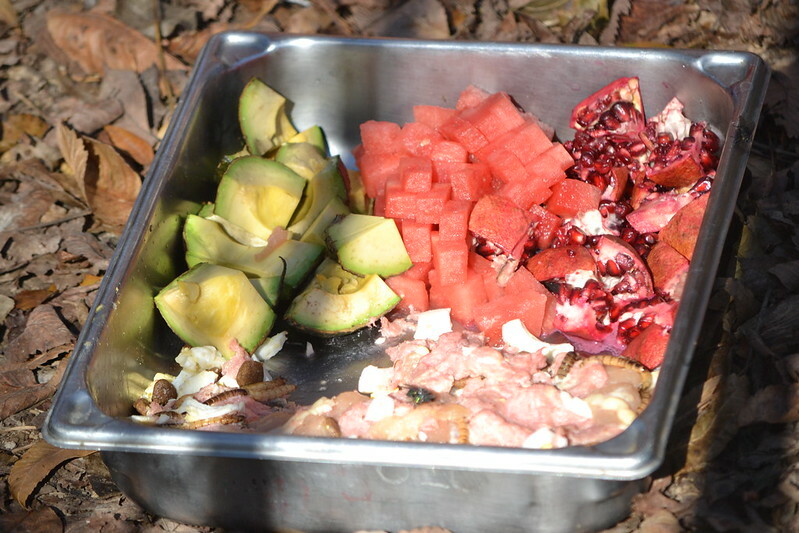 This is one of the coatimundi trays that is prepared each morning for Macano Coatimundi. Keepers keep a close eye on each of our animals each day. They are often the ones who see wounds or illnesses first. A couple weeks ago they noticed Tio Tiger was limping pretty badly on his right foot. When they were able to get a good look at his toe they saw the bone of his toe was coming back through the pad of his foot. 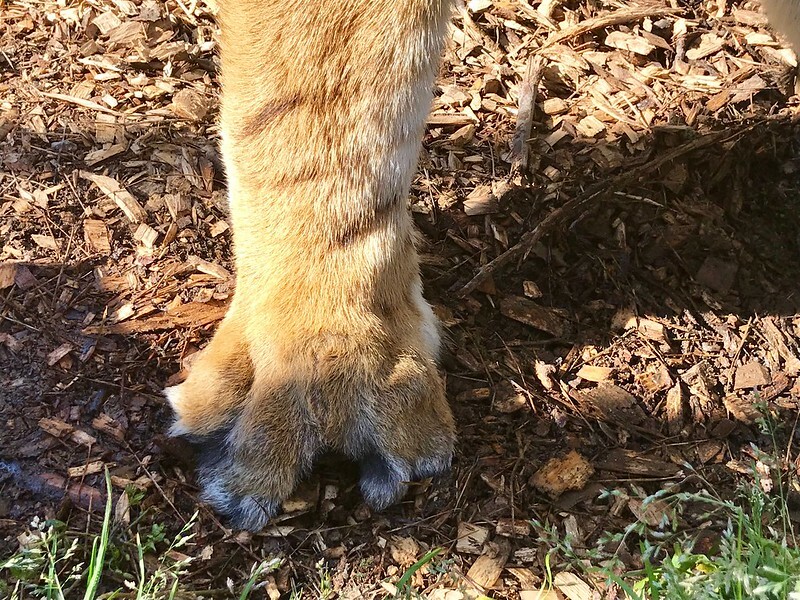 Tio was declawed long before we got him and because of a botched declaw the bone was growing back through the pad. This had to be remedied for him to have a better quality of life. The best thing for Tio was to remove the toe that was ailing him. Our veterinarian with the help of her vet tech, our curator, and our keepers performed the amputation on Tio’s toe. 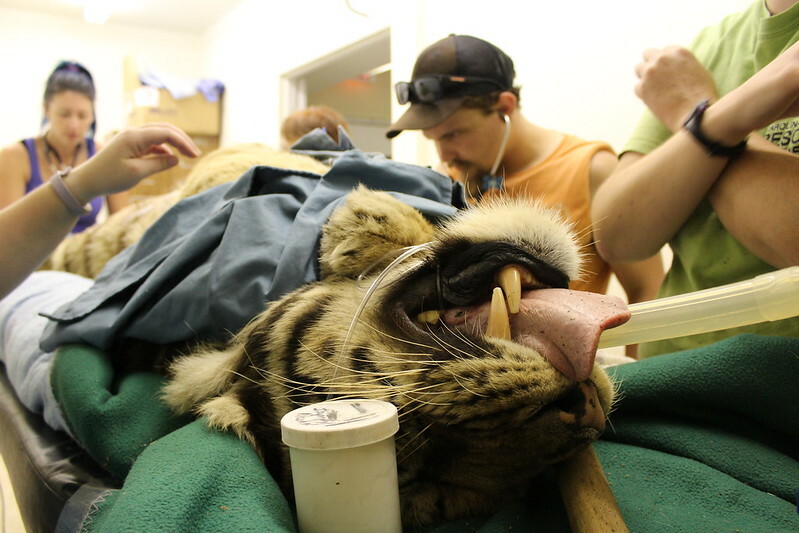 During a medical procedure, the keepers have the important job, of ensuring they are watching for any signs of the animal coming out of sedation. When they start to see reflexes from the animal, they alert our vet who administers more sedation medication. Once the toe was removed, the keepers must keep a close eye on Tio and how he is healing. They look for signs of infection and any signs of Tio biting at or chewing on the wound. Tio, fortunately, did great with the amputation and has returned to his normal self. Keepers will continue to monitor his progress to ensure he continues to be pain free. Each summer, the keepers as tasked with new challenges for keeping our animals healthy. Flies love to bite the ears of our big cats. 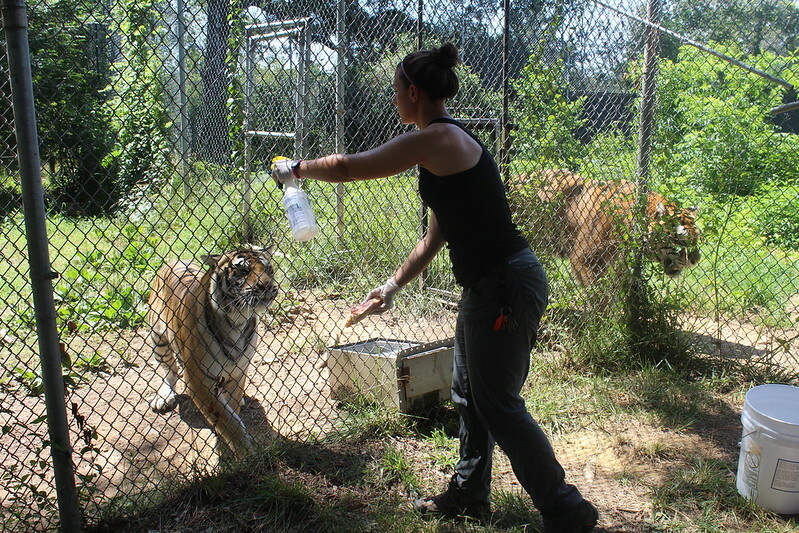 Our keepers must spray the ears of our big cats with spray to keep the flies from biting. 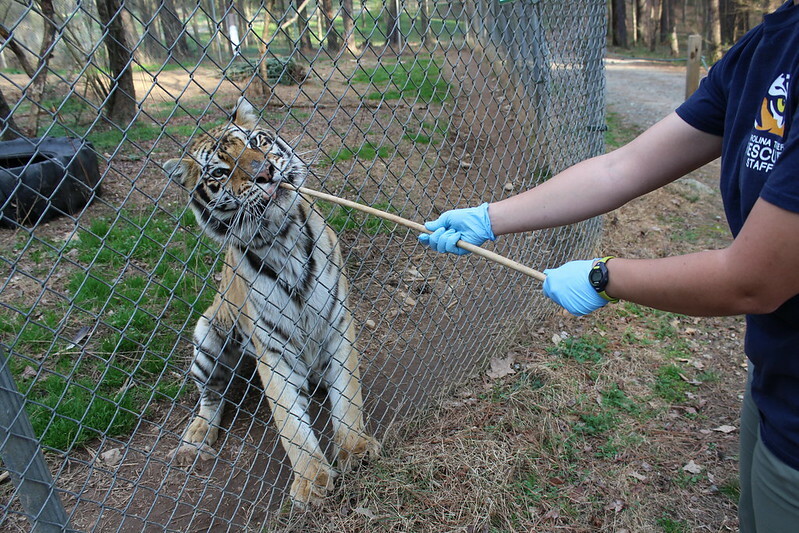 Most of tigers have to be enticed with treats to stand still long enough to get their ears sprayed. Keepers have to be persistent to get the job done. Operant Conditioning is a great way to get the animals to participate in their own health exams. Here, Emerson Tiger is opening his mouth on command so the keeper can take a safe look into it. When the animals have a choices they are more willing to participate and this allows keepers to get a better look at the animals without having to sedate them. Operant conditioning also helps lessen behavior issues that our animals can have, by providing them with positive reinforcement. Organizing and managing volunteers is also a daily task for our keepers. They must ensure everyone is trained in a variety of tasks and ensure that everything is done in a safe manner. Our animals get fresh water each day, and one of the first tasks our volunteers learn, is how to safely clean and change water dishes for the animals. The more the volunteers can take on, the more the keepers are freed up to do other necessary tasks. 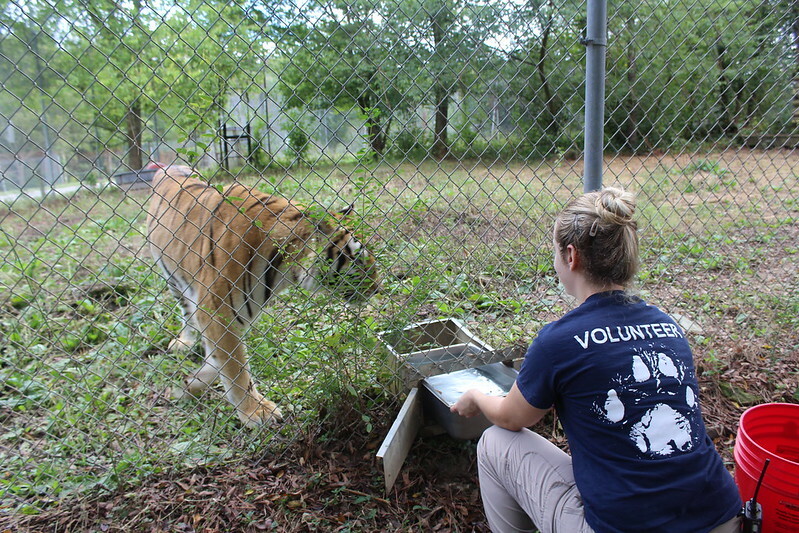 Each summer, Carolina Tiger Rescue hosts an internship program. This program is for 3 months and allows interns to get a taste of what it is like to be a keeper. Keepers are responsible for teaching, evaluating, and mentoring the interns. 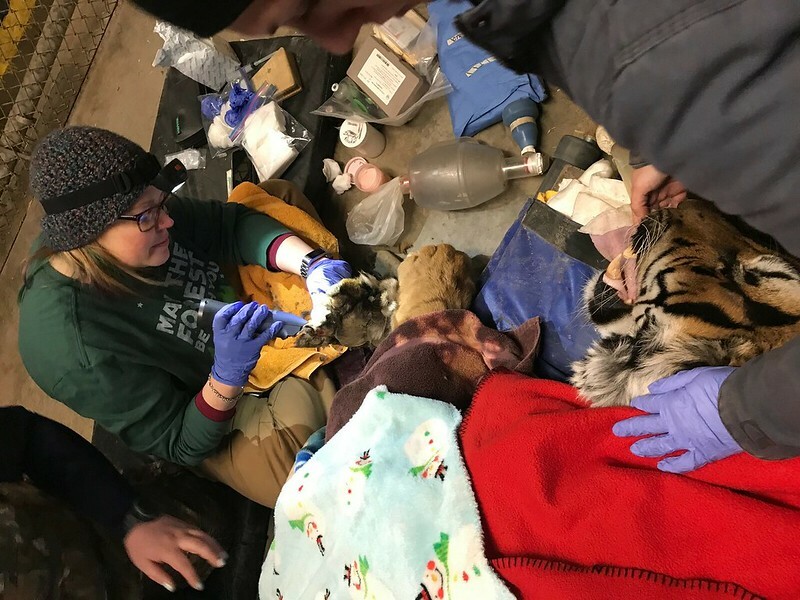 Interns learn the daily routine of the sanctuary, what it takes to care for these animals, as well as how we care for animals when medical needs arise. Our animals eat a lot of food! Our food budget is about $80,000 a year. Feeding of our animals requires organization and sometimes patience. Even though our animals love to eat, sometimes they take their sweet time to finish their food. Our keepers have to monitor how each animal is eating and how much. Animals, cats especially, are great at hiding illnesses. Subtle changes in how they eat can mean a lot, so keepers must keep a close eye. 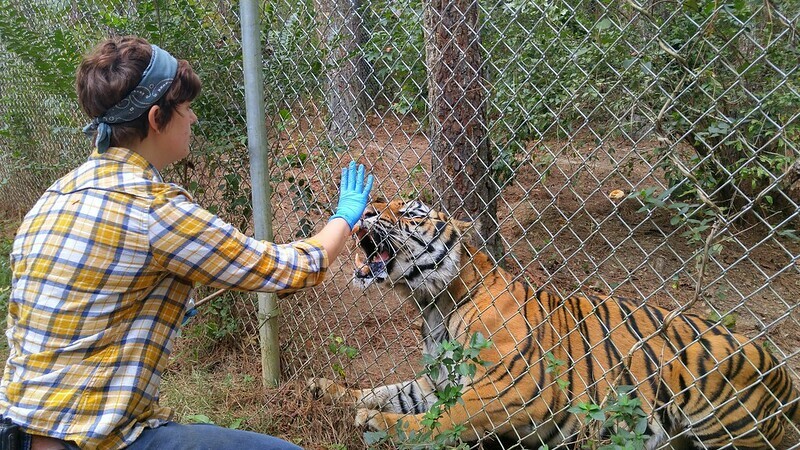 When a new animal comes to call Carolina Tiger Rescue home, they must go through a quarantine period. This lasts at least 30 days and allows us to ensure that if the animal has any health problems, we can address them before they can get any of the other animals sick. This time also allows them to adjust to their new home and gives keepers a chance to get to know the animal and their personality. Some of our animals come in extremely social and love the attention, while others would prefer to never see a human again. Keepers must gain the trust of the animals so they can provide them with their daily care in as a stress free environment as possible. Even our smallest residents make massive messes! Keepers are tasked with ensuring each animal has a safe and clean enclosure. Cleaning for some occurs daily, while others weekly. 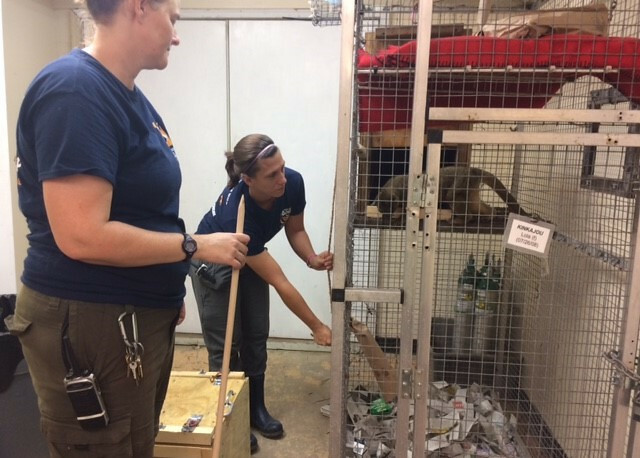 While cleaning the keepers are picking up old enrichment, putting out new enrichment, ensuring the fences are secure, and that any structures are safe for the animals. Enrichment is important in the lives of our animals. If our animals get bored they can get destructive. Our keepers ensure that our animals get enrichment each and every day to prevent boredom. 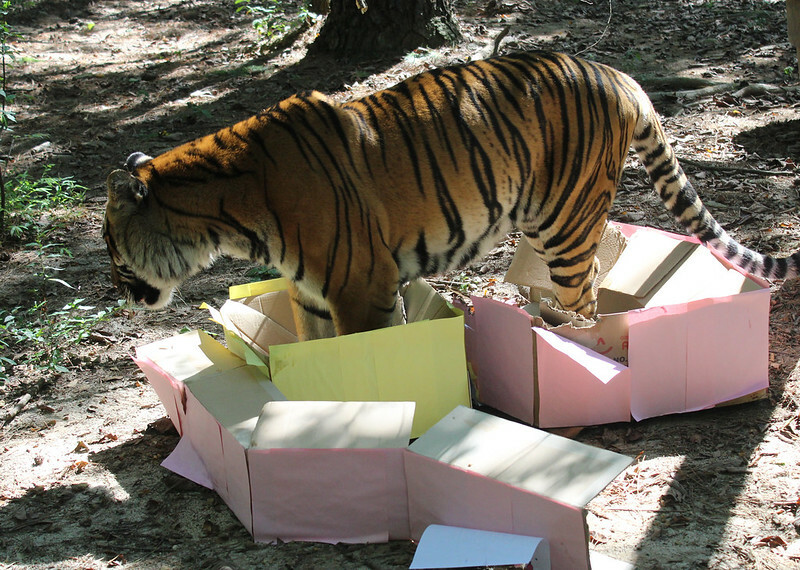 Sometimes enrichment is simply a pile of boxes (all cats love boxes!). In the fall they hand out pumpkins and in winter they get pine trees. Enrichment can come in the form of scent, texture, taste, or sight. All of these pieces allow our animals to be stimulated both mentally and physically. A keepers job is not easy nor does it ever stop. 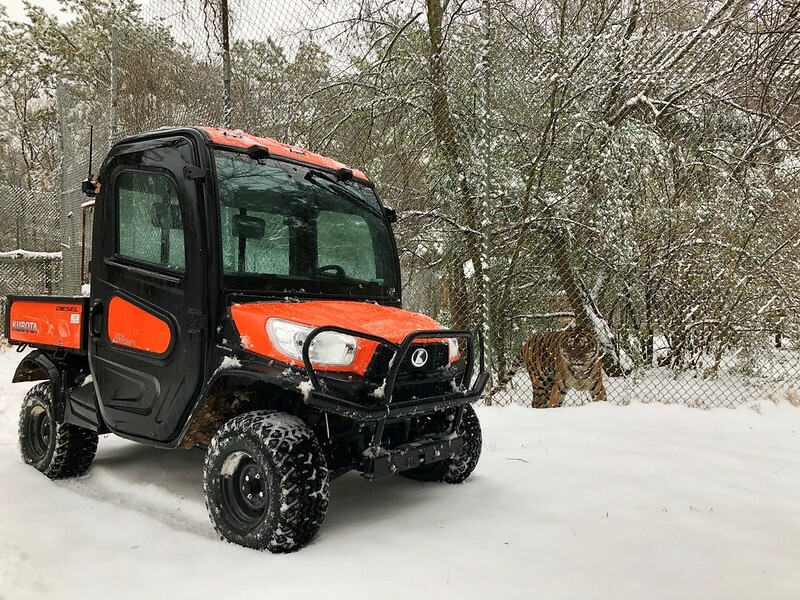 In all weather our keepers must be here and available for the animals. When bad weather is predicted they pack up their lives and live at the rescue to ensure they can get to the animals. While it is a tough job, it is a rewarding one. Not everyone is able to say they care for some of the top and most renown predators in the world.